Detailed Review of The Powertec Power Rack - With Video! 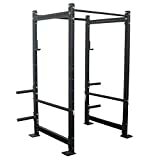 A step up from the entry-level power racks, the Powertec power rack is an excellent heavy duty rack built to take a beating, it provides a safe way to perform all of your barbell power exercises such as deadlifts, squats, rows and all pressing movements with the security of the spotter bars. With a 1000lb weight capacity, you’ll never need to worry about outgrowing this rack, it should last you many years as your strength progresses with barbell training. Do I Need The Powertec Pulley System? Powertec’s rack has purposely been built shorter than commercial racks, (although upright extensions are available to buy separately if you need some extra height). There’s a good reason for the racks standard 84″ height, commercial racks are tall, you would need a nine foot ceiling to fit a commercial gym rack in to your house and not many of us are lucky enough to have 9ft ceiling height, so you will be happy to know the Powertec power rack fits under ceilings of 7.5 foot will a little room to spare, making the rack a comfortable fit for most garages and basements. The majority of home ceilings are 96″(8 feet) in height and the power rack stands at 84″, take into account another 12″ clearing above the power rack for chin-ups and you will see it has been designed perfectly to fit into most homes. Built from heavy-duty powder coated 2 1/2″ steel tubing this rack is going to be tough. Powertec’s rack is quite heavy at 200lb and this is exactly what you want. The weight of an empty rack, in general, provides us with a big clue to the stability and overall ruggedness of the rack. 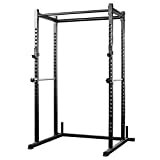 Wide racks that are deep and tall with large frame gauges will weigh the most. Cheap entry level racks can weigh anything from 100-150lb. Heavier racks(200lb+) help with the stability especially important if the rack is not bolted to the floor. Cheaper racks have a tendency of tilting forward, this is somewhat dangerous and one of the main issues you come across with lighter racks. 400lb max weight capacity on the pull-up and chin-up bars should easily be enough for most weightlifters, there have been a few minor reports of a slight wobble when doing chin-ups but nothing serious enough to be off-putting. It’s also nice to see the hole spaces on the upright posts have been numbered. Racks with hole spacing of 2″ or less have lots of holes, the good kind we need…and it really helps if these holes have been numbered, it lets you quickly adjust the safety rods and note down the number of the holes in a log if you have one, saves a ton of time counting the correct number of holes on each upright. Great to see dip bars included in the price, dips are awesome exercises for increasing lower pec mass, including a dip attachment gets a big thumbs up from us. This rack is reasonably priced at $600 and includes both the dip and pull up attachments, I’m sure most of us will be perfectly happy with the rack as sold in standard form but there is a whole host of attachments you can buy for the rack, some more useful than others. Weight plate storage horns – The storage horns fit the rack using Powertec’s innovative gravity locking system, well worth a look if you want to save some space on your gym floor and easily accessible to the bar on the rack. Comes in a set of two. Step up plate attachment – The step up attachment allows you to perform exercises such as Glute-Ham Raises, Step-Up Plate Depth Romanian Deadlifts, Incline Sit-ups; a versatile attachment that you can adjust to different heights depending on your needs. It’s a good idea to counter the weight when using this by having one of the storage horns loaded with weight plates on the other side of the rack, this will give you some added stability. Rope strength ring attachments – Allow for strength bands and exercise ropes, you can attach and adjust at various height on the power rack uprights, also available are anchor attachments for strength bands, these can be attached to the base of the power rack. Multi-grip pull up bar – A newly designed multi-grip pull up bar, allows for a variety of grips for different exercises. A pulley weight training system provides you with constant resistance, unlike the variable resistance from free weight exercises, whilst both are very important to your training there are some constant resistant exercises we can’t duplicate with free weights, tricep pushdowns and lat raises to name a couple. So having a pulley system attached to the power rack does open up additional important exercises to you and adds a different type of resistance. You save a lot of space by choosing a power rack that can take a pulley system as an attachment, it will save having to buy a separate pulley machine. Even if you can’t afford this option now, it’s always a good idea to choose a power rack that has this option, you can add it at a later date if you so choose. Because of its high max weight capacity, this rack will suit all types of weightlifter from beginners right up to the extreme of lifters. Although you will gain strength from fast barbell training, not many of you will need anything higher than a 1000lb capacity, there’s enough capacity there to last a lifetime of strength increases. 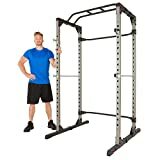 This is not an entry-level power rack, it’s a mid-range tough stable rack suited for nearly all home gyms and maybe some light commercial use. Fantastic to see a lifetime warranty with the frame, shows Powertec have a lot of confidence in their product, bear in mind the lifetime warranty does exclude the paint job. 2 yr warranty for parts, excluding spring pins and bearings. One year coverage for grips pads and undefined parts. Shipped in pieces and will need assembly upon arrival. Summary An excellent heavy duty rack from Powertec, built to last with a lifetime frame warranty this rack will not disappoint even the most serious of weightlifters, great to see such a selection of useful attachments on offer, making this rack even more desirable for any home gym.